Most freight cars spend decades working in the wind, rain, cold, and heat before reaching retirement. The metal of the roof expands and contracts on a regular basis despite joins, bolts, rivets and welds; inexorably wearing away the protective coatings applied. Modern paint coatings, those that do not use lead in their formula, are less able to cope with temperature extremes, Ultraviolet (UV) light and the cumulative effect of acidic rain water. The result is the faded, dented, colour faded rust buckets we so often find riding the rails today. Before we begin to weather a simple understanding of the mechanisms will make a big difference to your efforts. I wish that I’d had all of this information to hand before I got into weathering in the early 2000s. The two main causes of weathering are physical and environmental. Physical is the daily interaction between the parts of the railcar, doors on runners, locks on doors, forklift forks on boxcar walls, the scraping of weeds and tree limbs along the exterior posts of boxcars and so on. Environmental effects include UV light, rain, heat, cold, wind and the area of the nation where all of this occurs. UV: fades the colour of paint – pure and simple. Modern acrylics suffer fade faster than older lead based paints because lead paints while deadly to people and very bad for the environment resisted UV that much better. Rain: is acidic and the primary part of chemical weathering. When dry the rain leaves behind the dissolved acids on the surfaces it lands on. Over time more rain and drying cycles serve to strengthen the concentration of acids until the surface begins to fail. This rain weathering is a critical part in railway model weathering because we usually have a large roof surface area directly affected by rain and all weathering effects will run down the side of the car because of it. Heating and cooling: cause movement of metal panels due to expansion and contraction. Grinding together metal is not conducive to a long-lasting painted finish. Additionally the weathertightness of a car suffers as the physical barrier to water and contaminant ingress begins to fail often resulting in weather proofing measures being applied. Wind: generated naturally or by movement of the car has a great effect on the exterior painted finish. high wind speeds and small airborne particles can effectively sand blast the sides of a car whether standing still in high winds or during movement in a train. It is worth noting that a train in motion causes a partial vacuum beneath the train at speed. This does occasionally lift rock, metal particles and ballast from the track level upwards against the ends of the car and is the major cause of weathering in this area. Location: changes the look of weathering on a car. Cars spending most of their time in desert environments are dustier and abraded than cars that live in wetter climes. It is worth knowing where you are modelling. Since the location of my layout is in Central Texas I know that while there are rain storms, often deluges, overall the colour of the dust and dirt thrown up are typical Texas light pinks (granite ballast), greys and light browns. The sun is stronger for longer throughout the year and so cars here are more faded than say one would be that is located mostly in the pacific North West or New York or Boston. Weathering essentially is the interaction between metal and other chemicals to produce rust. That is iron (Fe) and water (H20) making iron oxide (FeO2). In order to understand what that means we need to understand how metal weathers, what colours occur and how the light reflects from the weathered surface. 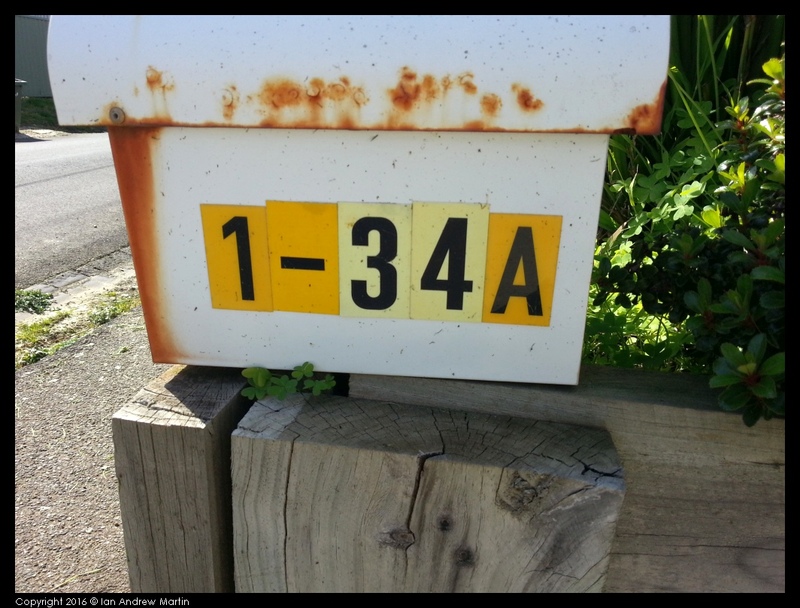 One example that is close to home is this letter box. It is around 6 years old (as of 2016) and is already advanced in its painted surface and metal structure failure. 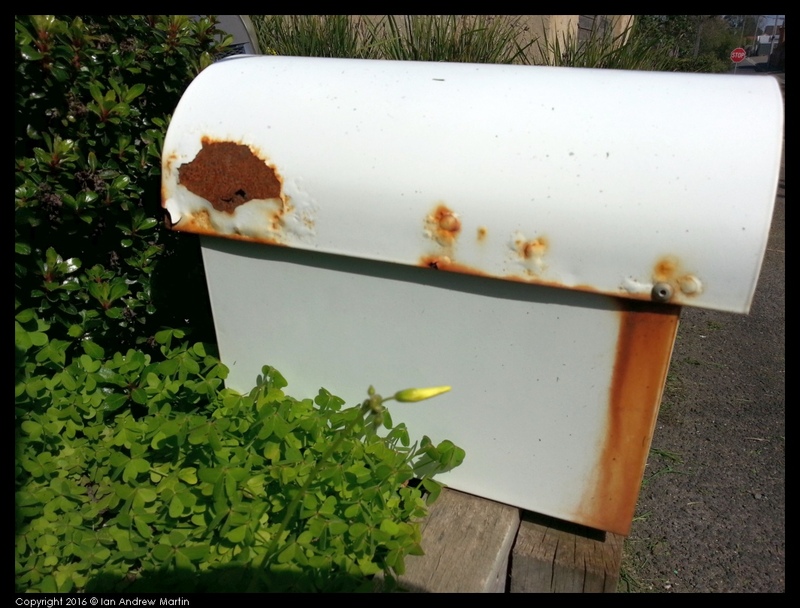 Let’s take a good look at the mailbox and see what this humble appliance can teach us about weathering. There are several interesting features to be found in this image. Despite being painted in a high gloss white paint only 6 years earlier the finish of the paint is now a worn matt white. With rust now coming through wherever metal and metal join the painted surface has already failed. There are some common points to note between photos one and two – primarily the rust staining below the riveted pivot point. This is where two different metals meet, the thin mild steel of the carcass and the aluminium of the rivet. And it is here that the main rusting began. Image two also shows the pitting and failed surface on the eastward side of mailbox. On both images you can see the spot welds as rust spots. In image one you can even see the point and circle of that the spot welder makes in joining the two metals. What is most important is to see that weathered surfaces are heavily worn and close to dead flat. Rust on the other hand is dead flat, pitted, gritty. Ranging in colour from a very dull brown through reds to shades of orange and yellow depending on the age rust is a difficult and challenging modelling task. It is so very nice though when you get it right. Enough of the science, let’s get onto the modelling.